If you were accused of a misdemeanor or felony in the Sixth Judicial Circuit in Pasco County, FL, then your case will be heard at the courthouse in New Port Richey or Dade City. The Pasco County Detention Facility (also known as the “county jail”) is located between these two cities in Land O’Lakes, FL. Most criminal cases begin with an investigation by a local law enforcement agency including the Pasco Sheriff’s Office, the New Port Richey Police Department, the Port Richey Police Department, the Dade City Police Department, the Zephyrhills Police Department, or the Florida Highway Patrol. If you were arrested or given a “notice to appear” in court, then seek out the services of an experienced criminal defense attorney as early in the process as possible. From the most serious felony offense to a first time misdemeanor charge, we have the experience necessary to fight your charges. Contact an experienced criminal defense attorney at the Sammis Law Firm to discuss the best ways to fight the criminal accusation. Our offices are conveniently located at 7509 Little Road, New Port Richey, FL, 34654, directly across from the courthouse at the West Pasco Judicial Center. At the Sammis Law Firm, our four attorneys are devoted exclusively to fighting criminal charges in the Sixth Judicial Circuit for Pasco County, FL. We help people after an arrest or criminal investigation in New Port Richey, Port Richey, San Antonio, Zephyrhills, Land O’Lakes, Dade City, Trinity, St. Leo, Meadow Pointe, and Concord Station, FL. Contact us to discuss your felony or misdemeanor case during a free and confidential consultation. Find out more about the charges pending against you, ways to avoid the potential penalties, and the best way to fight the charges. Determining the separation line within the county is difficult because no easily identifiable geographical separation exists. 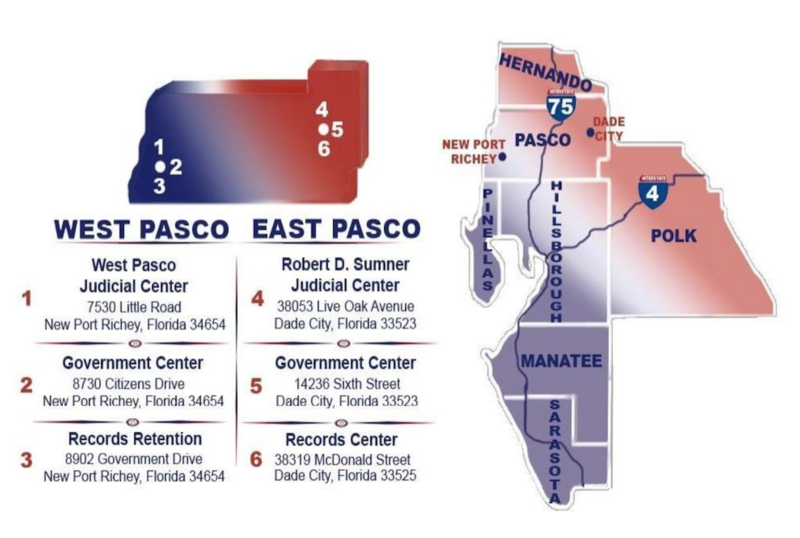 The easiest way to determine if your case is an East or West Pasco case is by identifying the law enforcement agency involved. Circuit court and county court judges preside over cases in the judicial facilities located in New Port Richey and Dade City. If the case is being handled by an East Pasco County law enforcement agency, then it will probably be heard at the Robert D. Sumner Judicial Center in Dade City at 38053 Live Oak Avenue. If the case is being handled by a West Pasco law enforcement agency, then it will probably be heard in the Pasco Government Center in New Port Richey at 7530 Little Road. the Sheriff’s Office – East Pasco Patrol Division. the Sheriff’s Office – West Pasco Patrol Division. Judge Shawn Crane presides over adult drug court. Judge Kim Campbell in Section 4 presides over 50% of criminal cases, including section 4 violations of probation and indirect criminal contempt affidavits filed in Section Q2 and prosecuted by the State Attorney’s Office. Judge Mary M. Handsel in Section 3 presides over 50% of criminal cases, including section 3 violations of probation and indirect criminal contempt affidavits filed in Section Q1 and prosecuted by the State Attorney’s Office. Judge Philippe Matthey presides over juvenile delinquency cases. Judge William G. Sestak is assigned to Section 10 and 14 for Misdemeanors, DUI, criminal traffic, violations of probation and orders to show cause relative to cases heard under this jurisdiction while presiding. Judge Joseph A. Poblick in Section 16 presides over misdemeanors, DUI, criminal traffic, violations of probation and orders to show cause relative to cases heard under this jurisdiction while presiding. Judge Anne Wansboro in Section 15 presides over misdemeanors, DUI, criminal traffic, violations of probation and orders to show cause relative to cases heard under this jurisdiction while presiding. Judge Debra Roberts in Section 17 presides over misdemeanors, DUI, criminal traffic, violations of probation and orders to show cause relative to cases heard under this jurisdiction while presiding. We created this website to provide very general information about very specific criminal offenses under Florida law. This website also explains many of the possible defenses that can be used to fight these types of charges prosecuted in Pasco County, FL. Our juvenile defense attorneys in Pasco County also represent young people accused of a crime in juvenile court in New Port Richey and Dade City, FL. Criminal cases in Pasco County will be held at either the New Port Richey or Dade City Courthouse. Dade City is the county seat of Pasco County, located approximately 39 miles north of Tampa. The city was named after U.S. Army Major Francis L. Dade, who, with his entire army, was massacred by Seminole Indians in 1835. As the 12th largest county in Florida by population, the six municipalities in Pasco County, Dade City, Zephyrhills, San Antonio, Saint Leo, New Port Richey, and Port Richey. The municipalities were established between 1889 and 1925. If you have been arrested or believe you might be for an offense in Pasco County, Florida, your criminal case will be transferred to a courthouse in New Port Richey or Dade City, Florida. Contact a lawyer experienced in handling criminal cases in Polk County, Florida. DUI Attorneys in Pasco County – If you were arrested for DUI in Pasco County, you only have 10 days to file a request for a formal review hearing with the DMV to protect your driver’s license from being suspended. Visit our DUI information centers for articles about how you can protect yourself after a DUI arrest to avoid conviction for cases involving a DUI in New Port Richey or a DUI in Dade City, FL. Pasco County Traffic Infractions – Click here to find information about any traffic ticket, infraction, or citation in Pasco County, FL. Find a traffic fine schedule and traffic citation guide for electing to attend a driver improvement course or contesting the citation during a trial after entering a “not guilty” plea. You can also find the sample forms used in traffic court including the motion to continue civil traffic infraction hearing, election to attend a driver improvement course, or the form for entering a plea of not guilty or no contest. Uniform Bond Schedule in Pasco County – Read more about the uniform bond schedule and special procedures in New Port Richey and Dade City for first appearance and emergency bond motions. Pasco County Sheriff’s Office – The Pasco Sheriff’s Office (PSO) was the first Sheriff’s Office in the central Florida region to adopt a full-scale body camera program for all patrol officers that began in early 2015. This article was last updated by Jason D. Sammis on Wednesday, October 17, 2018.